Energy acquisition due to the increase of oil price is one of the most important issues and policy for most countries. Varioustankers have been built in the world and sent to the trade market. It is necessary to build the port infrastructure and facilities to givethem proper services such as mooring, packing, storing, and transshipment, etc. However, the domestic guidelines or standards for designand construction for the dolphin berth among these facilities are out of date and do not meet the recent trend of tanker types. Therefore,it requires amendment on the guidelines or standards. In this study, a detailed analysis of the tanker fleet, covering 8,000 ships underoperation and order to build, is made to estimate the proper PBL(Parallel Body Length) of each tanker class. After discussion andcomparison on the dolphin berth design and construction codes of various countries, those are the leading countries of tanker operationand management, suggestion was made to amend on the design code. The referred codes are of Korea, Japan, UK, USA, and Canada.The analysis of tanker fleet shows the PBL as 0.45L under the normal ballast condition. In order to verify the deduced amendment on thedomestic design code for dolphin berth, it was selected one of the domestic dolphin berth, located at the Yeosu oil terminal, which is almostcompleted to construct. The design criteria and expected tankers to moor in that terminal were analyzed and the appropriateness andcountermeasure for deficiency were summarized. The volume of world ocean trade is increasing 3.6% annually since 1990 and oil and petroleum product are 1/3 of total trades. According to Clarkson Tanker Register (2012), tanker trade volumes in terms of demand are expanding by 2.7% (based '00∼'10 years) annually. Among them, it was shown that oil is increased by 1.9% and petroleum products are by 4.8%. By comparison with other fleets, due to stable oil production and increase of energy consumption, there is no drastic change. Such weak growth in world trade volumes was last seen in the aftermath of the 2008 financial crisis and in 1998 after the point bubble. A large and growing oversupply of tonnage continues to weigh down the tanker market. For the supply of product tankers and chemical tankers, distance-adjusted demand is expected to grow 4.4%. 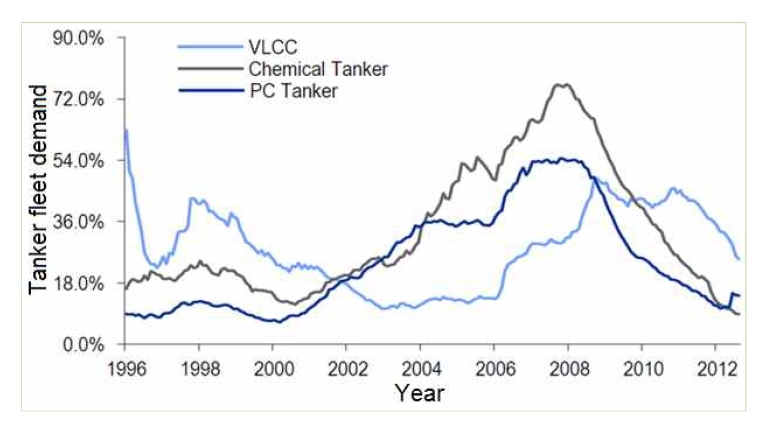 However, the chemical tanker market lost momentum in 2012 as demand failed to outpace supply growth (see Fig. 1). New building and secondhand tanker prices declined accordingly. The outlook for 2013 is dominated by the challenge of absorbing both the previous overhang of tonnage and another large inflow of vessels (Danish Ship Finance, 2012). Therefore, the outlook remains negative and low freight rates. Despite weak market conditions, some ship owners of product and chemical tankers regained their appetite for new vessels in hope of an early recovery and eco-friendly ship designs. For gas tankers, strong Asian demand supported the market and the outlook for LPG tankers is promising. As the replacement of the old vessels followed by out of service, and the increase of vessel delivery from over-ordered during a market boom, the vessels in service are very young in age. However, the berth facilities supporting these tankers are designed, constructed and operated from the standard or manual based on the old vessel types. They were not reflected the most recent ships’ trend from small to super size, and therefore, they face improper condition and get difficulties for berth operation. Sometimes various considerations are being made in berth operation process, such as adjustment to the position of quick release hook (QRH) at breasting dolphin and/or mooring dolphin, loading arm on loading platform, addition of sub breast dolphins, installation of flexible hose in place of fixed loading arm, and change of berth in service, etc. Therefore, a detailed analysis of the tanker fleet regarding ship size and type, collecting 8,000 ships under operation and order to build, is made to estimate and evaluate the proper PBL of each tanker, the length of loading platform, the span of breast mooring dolphins, and mooring stability. Through the comparison and analysis of the design manuals and standards of domestic and foreign countries (BSI, 1994; MOF, 1999; OCDIJ, 2002; OCIMF, 2009; TERMPOL, 2001; US Navy, 1986), it is intended to suggest for amending on the domestic design standard. The structural types of tanker terminal are classified such as dolphin type berth and pier type berth for fixed structure and single point mooring system (SPM) and multi-point mooring system (MPM) for floating structure. Among them the tanker terminal is the dolphin type in most cases, and pier type is in a few. Here, it is discussed mainly on dolphin type. The type of dolphin berth shall be determined in consideration of the natural conditions such as wind, wave, current, water depth, and bottom soil, the dimension of the target ships, construction condition and period, economic feasibility, effectiveness of berth use, and maintenance, etc. A typical dolphin berth mooring is shown in Fig.2. The basic elements which is common to most dolphin berth include: mooring (M/D) and breasting (B/D) dolphins including fenders, loading platform (L/P), mooring lines, deck fittings (such as bollards and bitts, QRH, and winches), fenders, and access trestles and catwalks. Mooring dolphins are designed for mooring loads and breasting dolphins are designed to withstand both mooring and berthing loads. M/D is not designed to withstand the impact of berthing. B/D normally has a fender system to absorb the impact of berthing vessels and may also be used to secure the vessel. The loading platform, which is installed midway between the breasting dolphins, may be used for loading and unloading cargoes, ship supplies, supporting work for shore maintenance, etc. In this case, it is desirable to locate the loading platform with its seaside front slightly backward(usually 1∼2m away) from that of the breasting dolphins, in order to prevent the ship berthing force acting directly on the cargo handling process (MOF, 1999; OCDIJ, 2002). Vessels are secured to mooring and/or breasting dolphins with mooring lines. Mooring lines are classified according to the type of load they resist and their location on the vessel such as bow, stern, breast, and spring lines. Bow, stern, breast lines resist lateral mooring loads and yaw moment on the vessel and spring lines resist longitudinal mooring loads as shown in Fig. 2. The first line ashore provides to assist in the initial approach and positioning of the ship alongside, in field head line or stern line. Those lines will have high elasticity and are unlikely to add to the final restraining capacity of the mooring system. Port facilities for oil tanker over 100,000DWT shall be constructed, improved and maintained to fit for the port design manual. For the facilities for oil tankers from 50,000 to 100,000DWT it should keep safety on mooring under the same design manual. They keep tanker terminal design and operation standard for VLCC class ships of LPG, LNG, ore terminal. Dolphins forming a lead-in system may be of the elastic type, gravity type or the rigid type with energy-absorbing fender units. Spacing should allow the smallest design vessel to lie alongside with at least two dolphins in contact with the straight run of the hull. Usual vessels can moor at the berth with two B/Ds and four M/Ds but larger vessels may require four B/Ds and six M/Ds. Mooring lines should be arranged as symmetrically as possible about the midship point of the ship in order to ensure a good load distribution that an asymmetrical arrangement as per Mooring Equipment Guideline (MEG3) by OCIMF(2008). The vertical angle of the mooring lines should be kept to a minimum. The flatter the mooring angle, the more efficient line will be in resisting horizontally applied loads on the ship. Head and stern lines are normally not efficient in holding a ship in its berth. Mooring facilities with good breast and spring lines allow a ship to be moored most efficiently within its own length. If there is limitation on the available lines, the overall restraining efficiency of a mooring pattern will be decreased and it needs two additional mooring dolphins because of their long length and consequently higher elasticity and poor orientation. It should be decided under the condition of manoeuvring by local pier geometry, surge forces or weather conditions. Breast lines should be orientated as perpendicular as possible to the longitudinal center line of the ship and as far aft and forward as possible. Table 1 shows the comparison of design standards and manuals for dolphin berth among major countries. 1) The span of B/D rely on the ship’s straight line defining the outline of the central part which accounts for about 3/4 of the length of overall of vessel and two curves defining the outline of the bow and stern parts(1/8 of the length overall of vessel each) at Korea and Japanese standards. From this the span of B/D is 1/3L but 0.25L∼0.4L in case of unknown ship’s spec. Considering the new ship building trend, it might be necessary to adopt ship’s PBL as 0.45L within USA limit of 0.3L∼0.5L. 2) Number of M/D depends on the ship’s size and 2∼3 M/Ds on bow and stern sides in general, and 2 B/Ds for each berth in the mid-ship area. 3) Head and stern lines are within max 30°∼45° normal to the hull, breast line is Within 15° normal to the hull, and spring line is within 10° from a line parallel to the hull in principle. As there are various types of ship size in service, there are some discrepancies on horizontal and vertical angles among standards of each country. The tanker outlook is characterized by a large inflow of new vessels and weak fundamentals. As a result, weak fundamentals and the overhang of tonnage combined with the relatively large order book dominate the outlook and owners might consider the prospects of scrapping the old or even 15-year vessels. From the summary of existing tanker fleet operation results, Suezmax class of 125,000∼199,000DWT is 20% greater than VLCC of 200,000DWT over and Aframax of 85,000 ∼124,000DWT. For product and chemical tankers, the demand for MR class of 40,000∼54,000DWT and LR class of 100,000DWT is getting higher than Handy class of 25,000∼39,000DWT. Therefore, there should be future terminal design and operation plans responding to this trend. 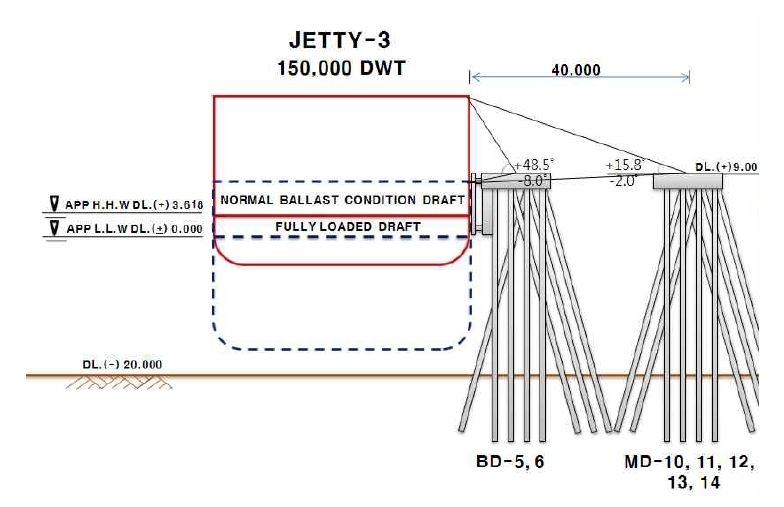 For the proper follow up for the tanker terminal design and operation, therefore, the specifications of tankers in operation in terms of LOA, draft, PBL (as defined in Fig. 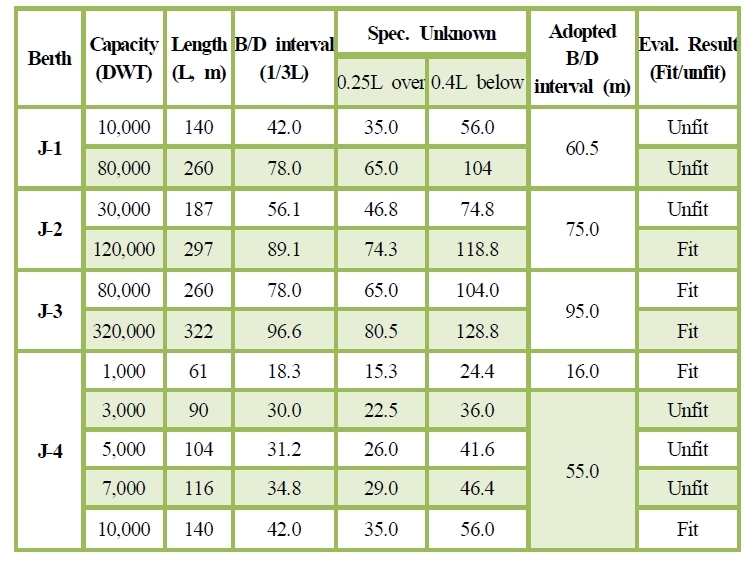 3), PBL/LOA with respect to DWT were analyzed and summarized in Fig.4 and Table 2. The PBL values are required to ensure that the vessel's parallel body length will make full width contact with the fenders when in position with the cargo connections made. Therefore, it is the most important factor for arrangement of B/D and decision of allowable tanker size at the terminal. Tankers selected for analysis were about 250 tankers under operation in the worldwide trade in 2012 and those of unclear PBL were neglected in the analysis. 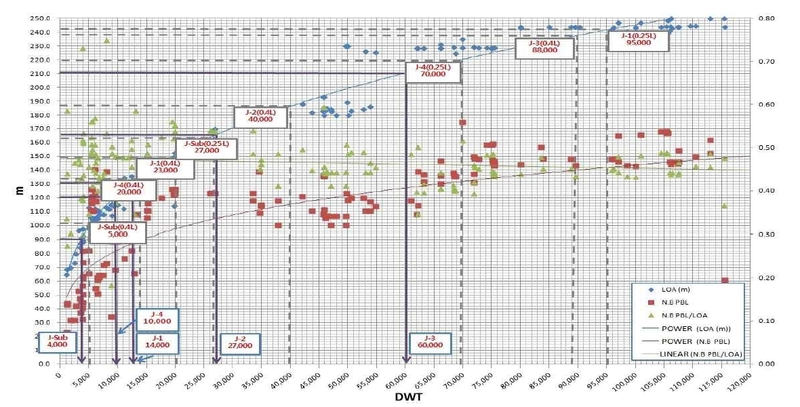 For the tanker trend of unknown DWT part, regression analysis and curve fitting to the existing data were used. The analyzed PBLs are 0.47L at full loading (FL) condition, 0.45L at normal ballasting (NB) condition, and 0.32L at lightship (LS) condition. Comparison of tanker specifications between standard and existing tankers from 1,000DWT to 320,000DWT standard tankers are shown in Table 3. The PBLs of tankers are varying depending on the loading condition. Generally, the PBL of NB condition is 79∼98% of FL condition and the PBL of LS condition is 50∼85% of FL conditions. The results show that the PBLs are located at 0.34∼0.53L under NB condition. The draught and free board will be used to evaluate vertical line angle at the mooring terminal. Dolphin berths for domestic liquid terminals were designed and constructed meeting the present design standards. The moorings of a tanker must resist the forces due to some, or possibly all, of the factors such as winds, current, tides, surges from passing ships, waves, ice, and changes in draft, trim or list, etc. Various dolphin berths including foreign terminals were analyzed but here, comparison of only limited domestic dolphin berths was introduced as shown in Table 4. Berths A, B, and C are located at the west coast and D is at the east coast of Korea. All berths are designed to accommodate wind and current forces including above mentioned forces in terms of DWT. Most of the berths are met the berth capacity limit in terms of breast dolphin intervals, except berth A and D. Outer B/Ds for PBL of 10,000∼50,000DWT at terminal A is too wide and so those for PBL of 10,000DWT at terminal D is. All berths have equipped with QRH for terminal safety. However, some mooring problems exist at each berth in terms of horizontal and vertical mooring line angles. For vertical mooring line angle analysis, draught of tanker for normal ballast (NB) condition was adopted for design. Especially special cautions are necessary for the berths in the west coast due to high tidal range. Design analysis of dolphin berth in domestic terminals was done for evaluation of design tankers and terminal facilities in a new oil terminal and necessary strategic guideline was introduced to meet the recent trend of tanker fleet. Selected oil terminal is the Yeosu Oil terminal as shown in Fig. 5 and four berths (J-1 through J-4) are arranged. Various factors regarding mooring system were analyzed for the proper mooring limits. 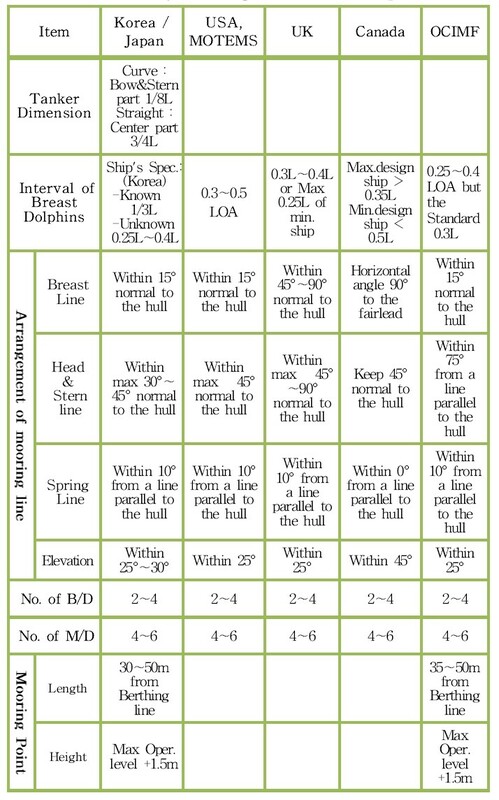 As per the Korean guideline, the adopted B/D intervals of some berths were not within the limit (0.25L ∼0.4L) and therefore, those do not fit for safe mooring as shown in Table 5. The horizontal and vertical mooring line angles were also analyzed. Fig.6 is an example of vertical angles of mooring lines at B/D and M/D under different loading conditions. As per the analyzed result, the vertical angles are within the design standard limit but some of the horizontal angles at B/Ds of J-3 and J-4 berths are slightly over the design limit. In the analysis of M/D intervals at each berth, there were no problems but B/D intervals were not within the design limit. 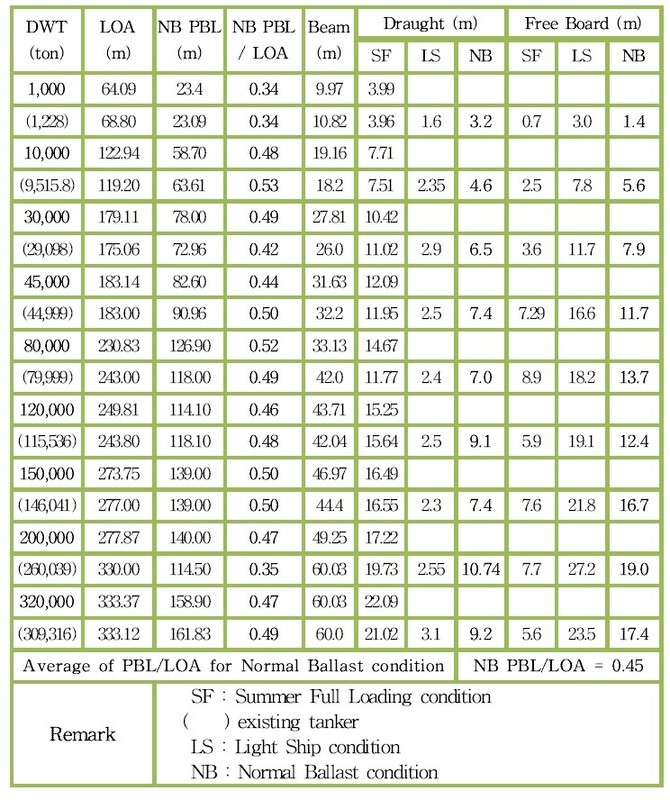 Fig.7 shows lower mooring limit at each berth under NB condition from statistic analysis of the worldwide tanker fleet and the summary of the possible smallest tanker at each pier is shown in Table 6. The design minimum DWT did not meet the standard limit case (0.25L∼0.4L) and among them, DWTs for 0.45L at each berth is proper for the target. J-SUB is the recommended two sub-B/Ds between the existing B/Ds at J-4 berth. 1) The trend of LOA, PBL, PBL/LOA under FL condition, NB condition, and LS condition with respect to DWT were deduced by the least square method to fit the curve. The estimated PBLs were 0.47L for FL condition, 0.45 for NB condition, and 0.32L for LS condition, respectively. 2) In order to figure out the fore & aft mooring and breast line linking points of ship side on the design plan, the analyzed tankers' general arrangement drawings show that the fore & aft mooring winch are located at 3.7m∼24.7m from the ship's edges and breast winch is located at 3m∼5m from those winches. 3) Under the NB condition, PBL is 79∼98% of the FL condition and the LS condition gives PBL 50∼85% of the FL condition. Therefore, the loading condition will change the mooring status at the B/Ds and the limit of B/D interval will be changed, too. 4) The interval of B/D in the design code taking account of the actual variation of geometry of the vessels to be berthed, from the trend of tanker type should be in the range of 0.3L∼0.5L as US code. The analysis of tanker fleet shows the PBL as 0.45L under the normal ballast condition. 5) The number of B/D is usually two and M/D is four to six, depending of the size of tanker. B/D interval should be such as to allow the smallest design tanker to be able to lie alongside with at least two dolphins in contact with the straight run of the hull (PBL). Where the range of tanker sizes is large, then provision of two sub-B/Ds may be necessary. 6) The present design code for horizontal mooring line angles is proper for the tanker fleet mooring such that the angles between fore & aft lines and the vessel's should be smaller than 30°∼45°. The breast mooring line angles do not exceed 15°at M/D and the spring mooring line angles do not exceed 10°at B/D, too. As per the analysis of the tanker fleets in the world trade service, the straight line defining the outline of the central part which accounts for about 3/4L and two curves defining the outline of the bow and stern parts which accounts for about 1/8L in the Korean and Japanese dolphin design codes. Therefore, they need to be erased or amended as 1/2L of central part for the straight line and 1/4L of bow and stern parts for the curve. This work is the outcome of a Manpower Development Program for Marine Energy by the Ministry of Oceans and Fisheries. It was also supported in part by the SOST and the Korea Maritime and Ocean University grant. 1.BSI (1994), BS Code for Maritime Structures, Part 4. 2.Clarkson Tanker Register (2012), World Fleet Register CD. 3.Danish Ship Finance (2012), Shipping Market Review, October 2012, Denmarks Skibskireditv. 5.Kang, S. J. (2013), "A Study on Design Condition for Dolphin Berth by Tanker Fleet Analysis", PhD Dissertation, KMOU. 6.Lee, D. H., Lee, J. W., Kang, S. J., and Kim, H. J. (2013), "Design Condition for Dolphin Berth by Tanker Fleet Analysis", ANC 2013 Proceedings, KINPR, pp. 491-498. 7.MOF (1999), Technical Standards and Commentaries for Port and Harbour Facilities, pp. 1320-1340. 8.OCDIJ (2002), Technical Standards and Commentaries for Port and Harbour Facilities in Japan, Daikousha Printing Co., Ltd., pp. 494-524. 9.OCIMF (2009), "Mooring Equipment Guidelines", 3rd Ed., London, England. 10.Transport Canada (2001), Transport Canada mooring guidelines and codes for oil terminals: TERMPOL Review Process (TRP) for Marine Terminals (TP 743 E), Appendix 3 Berth, Mooring and Fendering. 11.US Navy (1986), Design Manual 26.4 (NAVFAC DM26.4), Fixed Moorings, Department of Navy.